At the bottom of this page are links to additional FAQ's by topic. How can I be sure of ownership, title, etc? 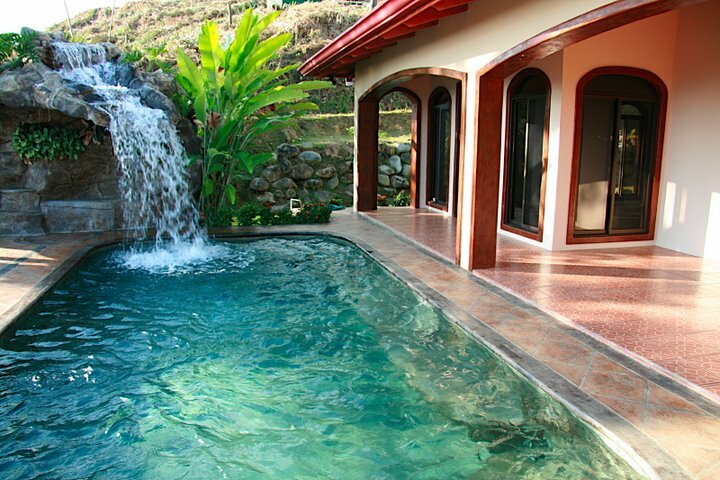 The properties are registered with the Costa Rican Land Registry. Each lot has its own registry number. Ownership of each property is through registration to a corporation, which is registered in the Costa Rican Mercantile Registry. All titles of ownership to the land and registry information for the corporation are available from the appropriate registry office and all property ownership records are online through a central government registration system. How do I hold ownership to the property? Each property is represented through the shares of the corporation that owns that particular piece of property. As a purchaser, your possession of the shares of the corporation indicates ownership of the subject property. The developer in Costa Rica holds an original of the sales contract and other documents relating to the property and corporation until you have completed payments for your purchase. His legal obligation is to insure you enter in full possession of your purchase, of both the corporation and property, once you have fully paid for the transaction. There are significant advantages to corporate ownership, which we discuss further below. Homes for sale in Costa Rica are typically sold by merely transferring the shares of the corporation that holds title to the home to the new owner. We have a new 18 hole golf course opening in San Buenas Costa Rica, the town right next door to our developments. Our developments in the towns of Ojochal and Tres Rios are to the north of the new San Buenas Golf Course and our developments in the town of Chontales are located in the next town south of San Buenas. The San Buenas course now has the first 9 holes open and plan to open the second nine holes within the next year. Do you sell ocean front property? Costa Rica does not sell ocean front property, the first 200 meters above the high water mark are public lands and held in what is referred to as "Maritime Concession Property". You can not own ocean front in Costa Rica although some hotels and condos have been built on concession property, but that property is leased, not owned. Our developments are on the hillside above the ocean on land that can be owned. We have ocean view but not ocean front. Our lots are all less than 3 miles from the beach and many are much closer. We are up the hill for the view and away from the noise from the highway. What is the closest town to our developments? We are in the town of Ojochal, a town noted for having great restaurants. Ojochal has about 2000 year round residents and more in the winter months. Although we don't have much of a downtown since zoning was open when many of the restaurants were built, we have nearly 35 restaurants and bars in town as well as 11 hotels. Most are on side roads off of the main road. We have a super market, a gourmet food store, wine bar, liquor store, gas station, etc. The next town north of us is Uvita where there are a number of large commercial plazas selling everything from furniture to appliances, a farmers market on Saturday, two very modern supermarkets, banks, etc. There is a duty free port in Golfito, about an hour away where we can buy things like flat screen televisions, sub zero fridges, high end stoves like Viking, Jenn Air, DCS and Wolf and any really high end appliance you might want like Bosch dishwashers or Fisher and Paykel Washers, Roper or Maytag Front loaders, etc.. The town of San Isidro, about a hour's drive from us has a Walmart, owned by Walmart but having a different name in Costa Rica. Our Water is artesian well water plumbed to all of our home sites, unfiltered and testing better than nearly every municipal water system in the US. It comes from the top of the mountain above us, there are two wells and holding tanks as well. Average water bills in town run less than $40 per year and we have un-metered and unlimited use! Sewage is septic, works great in Costa Rica. We install holding tanks and leaching fields sized to the needs of the houses we are building. The weather is 82 degrees year round, more humid in the rainy season from May to October. It can be pretty steamy at the height of the day but we usually have an ocean breeze. The temperature cools fairly significantly when the sun goes down. The dry season sees very little rain. Annual rainfall averages around 150 inches of rain per year. Most rain comes late in the day during the rainy season and it rarely rains all day. We get very hard tropical rain that comes down fast. We have prevailing breezes off the Pacific ocean which is right in front of us. We typically cool down by at least 10 degrees at night. Many houses have no heat or AC. Some people use AC primarily to remove humidity. We typically use split AC systems, a condensing unit outside and a wall mounted air handler inside, also referred to as "ductless" systems. Our electric is 110 volts, same plug as in the US. Our homes typically come with a 200 amp service. Costa Rica produces 97% of their electricity from renewable resources like hydroelectric, geo-thermal and wind. Electricity is cheaper in Costa Rica than many locations in the US and Canada. When will the new international airport be completed? Laura Chinchilla, the past president of Costa Rica, had made the new international airport a project of national importance. She pledged that the government would make $35 million dollars available in the upcoming budget and that construction would start soon with an international airport within the next few years. Update 2018, the new president is now has not yet decided what to do about the southern zone airport so nothing has been done to date other than the purchase of the land for the designated airport site, the ground studies, the wind current studies and the environmental studies are now complete. No we are up on a hill overlooking the ocean. Average elevation in our developments is from 400 feet above sea level to 800 feet up. The newest hospital in the country, the Hospital De Osa, is located almost directly in front of our developments. From the phase furthest away from the hospital we are about a 30 minute drive. From the closest point we are less than 10 minutes driving. Yes you can do anything with your property in terms of rental as long as it is "residential use". Many lots in our developments were zoned mixed use and in our latest development in Chontales, we zoned in commercial lots. Do you offer rental management? Yes we do and we charge roughly 10% of gross rent for long term rental management and 20% of gross rent for short term rental management, depending on the level of service you want for your tenants. We have our own rental management division that you can reach at www.OjochalVacationRentals.com We have a very strong rental market. You can also see available rentals, rates and availability at http://www.vrbo.com/(vacation rental by owner). Navigate to Central America, then Costa Rica, then the state of Puntarenas and the town of Ojochal. You can then see actual rentals, rates and calendars of availability so you can tell how well these rentals are doing. Many owners in our developments use sites like VRBO, Home Away, etc to rent their homes, using local owners to manage the cleaning, pools, etc. In fact our rental management company uses these same sites to keep our rentals (your home) occupied. Do you offer Gated Communities? We do a few forms of developments within our projects, en condominio urbanizations and parcela minima. Both require meeting local municipal standards for roads, water and electric similar to how most developments are built in the states. In many of our developments, roads within our developments become public roads once completed. In "en condominio" developments, there is a home owners association that provides additional management, formed by owners within the development. Many developments in Costa Rica are gated and considered "private developments" Gating a development is not necessarily a good thing since any development inside a gate does not need to meet any municipal standards. Think of living on a private road, no trash, no snow plow, no public utility, no roads maintenance crew from the city, etc. The owners of a private development are responsible for the infrastructure inside the gate. If the developer goes bankrupt or otherwise fails, the owners who bought are stuck footing the bill to finish the infrastructure. Developments are often gated for security. We have such a large presence in our area that crime is not an issue that we need to worry about. We have moved toward completing our more recent developments "en condominio". In reality the municipality often does not maintain the road to the standards our owners are trying to keep and attempts to have owners within a development contribute funds on a voluntary basis have proved difficult. By developing "en condominio" owners are legally required to contribute toward the upkeep of infrastructure within a development. Owners within these phases elect a board who then decides how much money they are willing to pay for upkeep as well as whether to hire a management company to do so. Unfortunately without a binding requirement, participation and payment for upkeep are not enforceable. It is worth noting that the development company has no ownership within these associations and does not benefit financially from their funds. How can I compare your prices and building costs to others in Costa Rica & other countries? Check out http://www.revealrealestate.com/ for a good overview of a bunch of projects in Panama, Belize, Nicaragua and Costa Rica. What are your closing costs? Our lots are deeded and Fee simple. We pay the closing costs when you purchase. You pay a one time fee of $1400 to set up the Sociedad Anonima (corporation) that you will hold your property in, much like an LLC in the US. Why is the new highway important? The southern region of Costa Rica has been difficult to reach until 2010 when both the new Caldera toll road opened from San Jose to the Pacific coast and the coastal highway known as the Costanera was completed. Prior to these improvements, the only way to drive from San Jose to our area on a paved road was on an inland highway known as the Cerro de la Muerte (passage of death). The new road improvements have opened our area to tourists as well as new commercial projects and this new accessibility is already causing property prices to rise as demand increases. Do you still have good ocean view lots available? We have a number of ocean view lots. A great ocean view lot will run 80k to 150k or more depending on size and what phase it is in. We are building custom homes for our clients starting at $120 per square foot and the quality of our construction is quite nice. All lots are fully improved with road, artesian well water piped to the lot and electric to the lot line. Mountain view lots start at $40k. What are my holding costs on property? What are the advantages of having one's property or any Costa Rica real estate owned by a S.A. rather than held in an individual's name? By law, anyone - Costa Rican citizen, resident, or foreign non-resident alike - may legally own land in Costa-Rica. For legal and tax reasons, however, ownership and transfers of Costa Rica real estate are best done through a corporation or S.A.Each of the ocean view and mountain view lots is a titled (fee simple) property. The actual transaction of buying Costa Rica real estate is not overly complicated, but can take some time. Remember that in Costa Rica, patience is a valuable asset. Each lot will be segregated to the new owner and then duly registered at the Costa Rican Public Record Office. Land transfers (sales) are granted through a public act. A Costa Rican Notary Public (lawyer) records this transaction by inserting the title transfer in his Protocol (numbered ledger). A Notary Public is a licensed Attorney-at-Law who is endowed with "public trust" and has the right to validate and legalize all contracts and deeds. The purchase deed is presented by the Notary to be duly registered in the public records. Every one of our lots will be registered in the Costa Rican Land Registry Office, each with its own registry number, as the lots are segregated and sold to individual owners. Each individual ocean view and mountain-view property is owned by a separate anonymous corporation (or S.A.), itself registered in the Costa Rican Registry of Corporations. All of the documents detailing ownership of the land and registry information of the corporation (S.A.) are available from the appropriate registry office. Ownership of recordable assets, such as real estate and motor vehicles, is now the main purpose of most of Costa Rica's registered corporations. This method of "indirect" possession is the most highly recommended means of managing recordable assets. An anonymous corporation, as the name indicates, provides a measure of privacy for its owner(s). It will be difficult to obtain information about who owns the shares, providing the discretion which many foreign investors desire. Personal liabilities are reduced by having your assets registered under individual Costa Rican corporations. If you own real estate in your own name, you will have to pay land transfer taxes every time a property is sold. As of this moment, if a Costa Rican corporation owns the property, land transfer taxes do not apply (although legal fees do) - if you decide to sell your property or give it to a family member, because you simply transfer the shares of the corporation to the purchaser. There is no capital gains tax paid in Costa Rica when you sell a corporation owning a property, since the sale is a private transaction. Inheritance taxes in Costa Rica are high, but an anonymous corporation (S.A.) never dies. Your spouse or your children can indeed enjoy the fruits of your labor without having to worry about such taxes, as long as you leave them the shares of the corporation in your will. They can then appoint themselves to the Board of Directors of the corporation and carry on the tradition. Isn't it costly and time consuming to file corporate returns? We offer an inexpensive administration package to take care of all of your corporate obligations, including municipal land tax and national income tax declarations required of every corporation. Since these corporations do not produce goods or services, they are considered inactive and therefore pay no income tax. They must still file an annual tax report indicating this inactivity however, a service we provide owners for $125 per year. NOTE: In 2011 Costa Rica enacted a new tax on passive corporations that now adds about $220 per year to the holding costs of a home in a corporation. Although this fee is significant, keep in mind that the property tax you pay is laughably inexpensive, so think of this added $220 per year as an addition to your annual property tax. What are the advantages of holding property via a corporation? By purchasing land via the formation of a corporation in Costa Rica, our owners are not subject to land transfer taxes when a property is sold, since only the ownership of the corporation changes hands. An anonymous corporation provides privacy to its owner(s), making it difficult for foreign government offices (IRS, Revenue Canada, etc) to obtain information about who owns the shares of the corporation, providing discretion which many foreign investors desire. Furthermore, there is no capital gain tax paid in Costa Rica when you sell a property owned by a corporation. You also avoid inheritance taxes when you pass along the shares of a corporation to your children, as long as you leave the shares of the corporation to them in your will. What rights do foreign property owners have? Costa Rica is known as the "Switzerland of the Americas" because of its social, political and economic stability. The rights of landowners are highly respected in this peaceful country, whether owned by nationals or foreign citizens. Unlike the case of many other countries where people have had negative experiences in regard to owning land, the rights of the landowner are established and protected in the constitution of Costa Rica, whether a local national or foreign citizen. Some people may have heard stories of squatters taking over land in Costa Rica. We've worked in the area for over 20 years and we have never seen it happen in any of our developments. Since the developer resides here on a permanent basis and their employees reside in the communities in which the developments are located, there is a constant presence on each individual site and it would be very difficult to squat undetected in any of our developments. Again it is not a concern in our developments. Squatters were a problem for people who'd bought a big farm somewhere intending to return someday to build a retirement home there. With no one to "watch the farm" squatters were an issue. Again squatters are Not an issue in developments such as ours. Can I become a permanent resident in Costa Rica? You can obtain residency in Costa Rica if you wish. You need not give up your citizenship in your home country of origin. As a resident, you have access to high quality free medical care and free education for your children, however low cost medical care is available to non citizens as well, at costs much lower than in the United States. Our lawyer can assist you in obtaining residency if you desire. Residency for retirees is the easiest form to get, known as "pensionado" status. Those who are not yet retired are eligible for "rentista" resident status and those holding investments in Costa Rica may be eligible for "inversionista" resident status. Many owners stay in Costa Rica as "perpetual tourists" heading to a neighboring border country for a weekend every 90 days. Many snow birds find that residency is not necessary, spending only 6 months in Costa Rica which reqires they leave the country once during each 6 month period. To qualify for the pensionado (retiree) residency status, you must prove you have at least $1000 in income per month, per couple, from a source outside of Costa Rica. For most people, social security is more than adequate to qualify them. How available are quality health care services? A new 80,000 square foot hospital located just a few miles from the developments has recently opened. This hospital, the Hospital de Osa, features all departments for primary care, critical care, pediatrics, emergency care and most services needed to provide great medical care locally. If major surgery or life threatening issues require specialized care, our hospital will refer patients to one of the many public and private hospitals in San Jose. Costa Rica is noted for providing high quality health care, comparable to that in the United States. Is heath care affordable in Costa Rica? Health care is available to all permanent residents, at very little cost. The average per capita spending on health care in Costa Rica is about $700 per year, compared to nearly $6000 per year in the US. Furthermore, life expectancy in Costa Rica exceeds that of the US. Even for those living in Costa Rica who are not legal residents, insurance is available for about $1000 per year that will cover most medical needs. Dental work is equally as cheap with root canals typically only a few hundred dollars and crowns around the same price. I recently had a crown and root canal and the bill was $300 for both! Our property taxes currently run less than $2.00 per thousand (including the newly formed luxury tax) or only $1.45 per thousand if the house is worth less than $172,000 US and therefore not subject to the luxury tax. As an example, a house valued at 250k will have a tax bill of less than $500 per year. How much do you charge to build my home? We are building custom homes for our clients starting at $120 per square foot. Remember you are free to hire any builder of your choice to build your home. Our highest end custom building utilizing Coventec construction and all custom interiors tops out at $135 per square foot. If I buy land in one of the developments, do I have to build right away? There are no time limits on building. Do I have to use the construction services of the developer? You are welcome to use any builder. You can even build your own home if you desire, but must comply with local building codes and requirements. Most clients use our construction services however and our reputation of building great homes without delays or surprises is why we have become the largest builder of custom homes in the country.